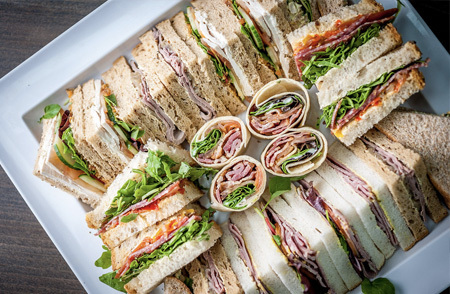 We specialise in every kind of buffet from your everyday office lunches to corporate fine dining. Our buffet menus incorporate local produce with some ethnic influences. We will design a menu that suits your taste and your budget if required. Our lunches are freshly prepared to order each morning using the finest and freshest ingredients and delivered to you in one of our fleet of refrigerated vehicles. Please feel free to mix the menus to suit your own requirements, minimum of four covers from each finger buffet, minimum of fifteen covers from each fork buffet, or if you prefer our executive chef will happily prepare menus for you. Seafood Catering All Buffet orders would need to be placed by 2pm the previous day, however, we understand that meetings can be arranged last minute and we will try to cater for your requirements. Daily Finger Buffet Prices start from £6.95 per person upwards. All menus come complete with quality disposable equipment, while the Fork Buffets are delivered with china, cutlery, table linen and all necessary glassware. "Just a note to say thank you and your team for your contribution in making our Magnus Summer Party at Castle Fraser such a fantastic event. Everyone has been raving about the food, which was both delicious and beautifully presented!"